This easy and cheesy spinach & bacon cobb loaf is the perfect summer BBQ food! Would you believe that until I made this cheesy spinach & bacon cobb loaf, I had never, EVER made a cobb loaf in my life. I know… how crazy is that!? Anyway, I clearly just didn’t know what I was missing out on. Because cobb loaf dips are good. Like really good. They’re also incredibly easy AND you can eat the whole thing!! 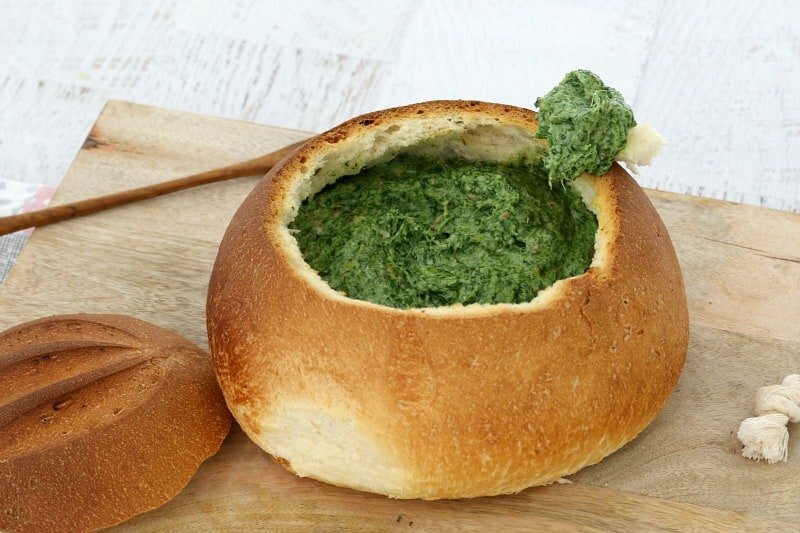 Including the cobb loaf that the dip sits in. Talk about no dishes, mess or washing up. See… it really is the perfect party food. You don’t even need to bring home an empty plate! Now before I made this cobb loaf, I asked in our FaceBook baking group for some cobb loaf tips. Seriously the people in that group know their stuff – and their tips for making the perfect cobb loaf dip were spot on! (PS. If you’d like to join our group, simply click here – we’d love to have you). In this recipe I used grated cheddar cheese, however you could definitely use a mix of cheddar, tasty, parmesan or mozzarella. Next time, I’m going to add in a bit of mozzarella to get that awesome stretchy cheese look. And so, whether you’re heading to a summer BBQ, having friends around for drinks or planning a party, add this cheesy spinach & bacon cobb loaf to your list. Mmmmmm……!! Cut a round circle from the top of the cobb loaf and set aside. Use your fingers to remove chunks of the bread from the middle of the cobb loaf. Set the bread chunks aside. Cook the bacon pieces in a frying pan over medium-high heat until crispy then place into a large microwave-safe mixing bowl. 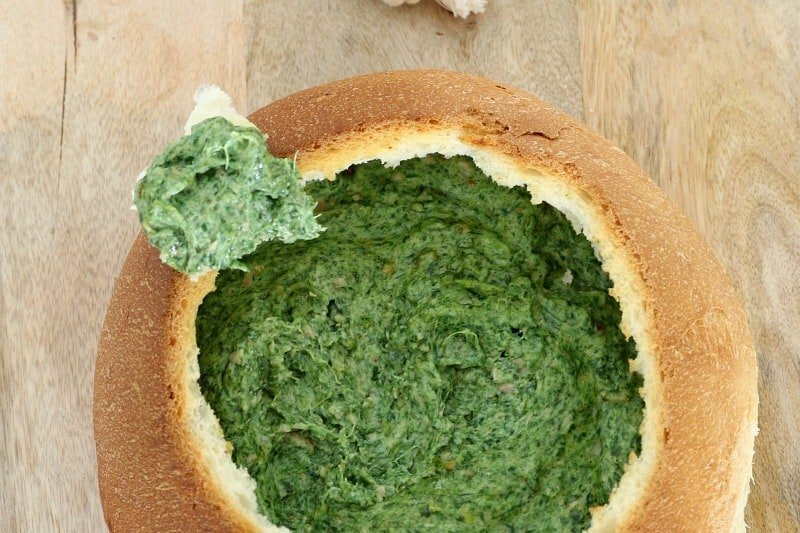 Place the defrosted spinach into a strainer and use a spoon to press out all of the excess liquid. 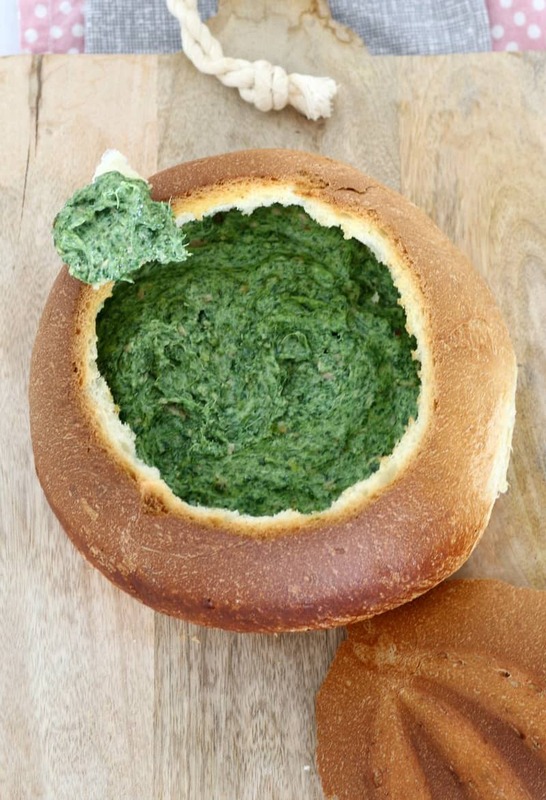 Place the strained spinach into the mixing bowl. Add the softened cream cheese, sour cream and tasty cheese. Place the bowl into the microwave for 2 minutes or until heated through. Spoon the mixture into the hole in the cobb loaf and place into the oven for 20 minutes (if the cobb loaf is browning too much, simply place a sheet of foil over top. After 10 minutes, add the bread chunks to the oven and cook until crispy. Place the bacon pieces into the TM bowl with the olive oil. Cook on Reverse, Speed 1, Varoma, 8 minutes. 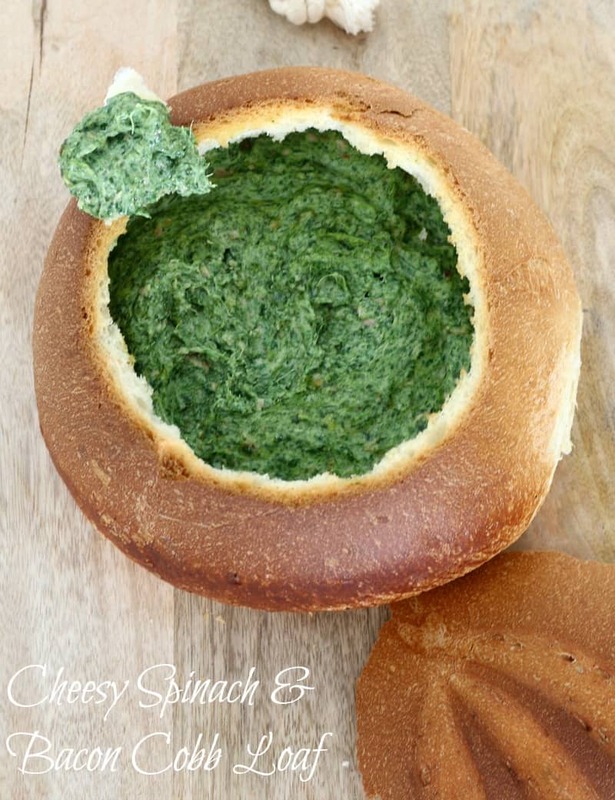 Place the strained spinach into the TM bowl. Cook on Reverse, Speed 1, Varoma, 8 minutes. Add the softened cream cheese, sour cream and tasty cheese to the TM bowl. Mix on Reverse, Speed 4 for 20 seconds or until completely combined (use the spatula to assist). Cook on Reverse, Speed 1,100 degrees, 3 minutes. 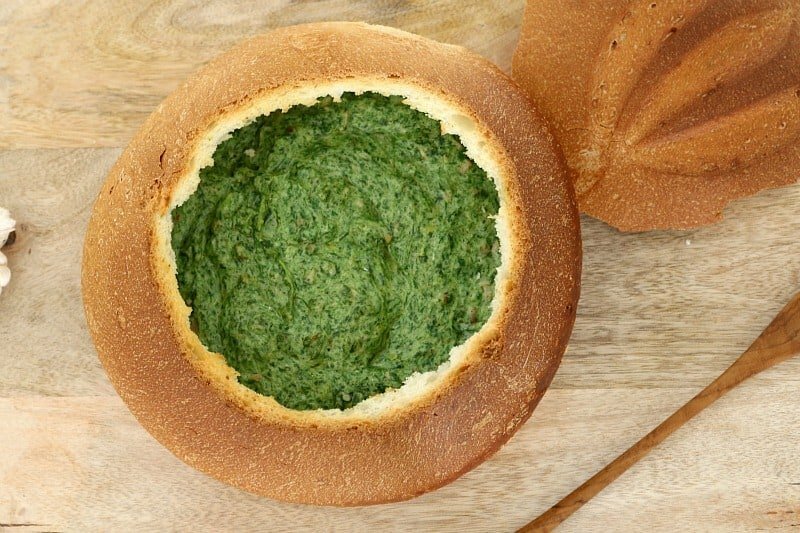 Yep you use the bread from the middle as well as the whole ‘basket’. Everything gets eaten! Oh awesome 🙂 Thanks Lucy! 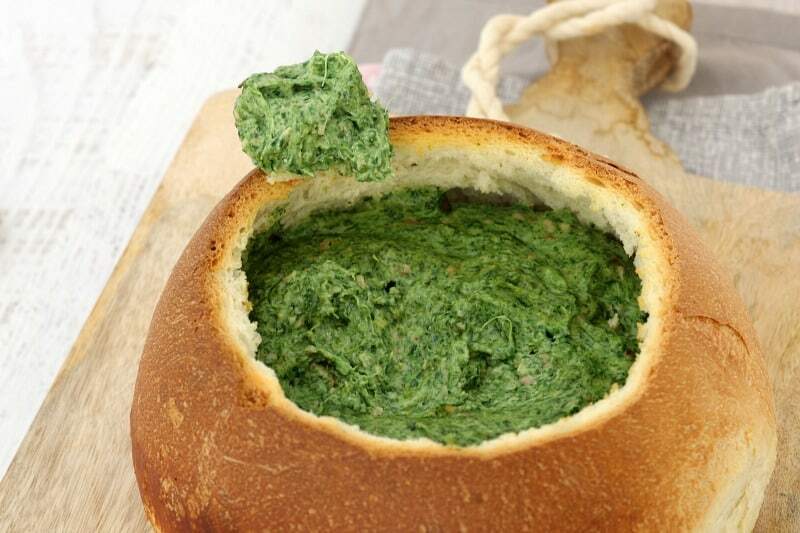 Hi, I will try this one, the one I make is similar but you use a packet of Continental Thick Vegetable Soup (which I can’t buy now), diced onion, 375g jar Praise mayonnaise, 300ml sour cream and 250g spinach. I find if you make it the day before the flavour goes through it better. I am going to try it with Continental Spring Vegetable Soup and see if it is as nice. I made the Clinker Rocky Road for Christmas and we all enjoyed it, so please keep up the delicious recipes. Hubby is a massive fan of cobb loaf dips, his sister makes a totally amazing (but seriously not healthy) cobb loaf dip and he goes crazy for it! 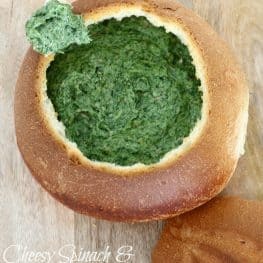 I wonder what he would think of this one with spinach in it. I’m totally up for it, it looks awesome! Hehehe yes they’re not the healthiest things ever (but SO good!!! ).